Good Hair Day – aka ghd – is one of the world’s leading hair styling brands based up t’ road in Leeds. We worked with them to create an LMS for sales training that brought fun and engagement through a social learning element. From its headquarters in Leeds, this successful Yorkshire company has developed a truly global presence. Its market-leading hair stylers and dryers are sold in 50,000 salons worldwide, and fans of ghd products include Victoria Beckham, Madonna, Gwyneth Paltrow and Jennifer Aniston. ghd brought Day One in to develop a learning management system for sales training with a social learning solution that could reflect the fun, sociable nature of their brand and their staff. Behind all the glamour, ghd is actually a very technically-focused company and its sales team are required to know all about the science that goes into making ghd products so awesome. They saw the value in using an LMS to deliver sales training in Leeds and across their global network of partners quickly and consistently at scale. ghd wanted an elearning solution to train sales staff and channel partners in the science and technology behind each of its products, but they wanted the training to be fun, engaging and in keeping with their innovative brand. To impress ghd, Day One needed to give its elearning a funky new style. Day One developed a customised learning management system for ghd, which was visually very flashy, on brand, accessible on a range of devices and packed with innovative new features. The elearning system itself provides trainees with engaging learning material that uses photos, video clips, music and animation to really bring the content to life. While online, trainees can choose from a selection of customised avatars (all with different hair styles of course) to make it more fun. Hairdressing is a very social profession, so it was only right that the LMS for ghd was too. Once trainees complete a training section and the end of module quiz, they have the option to share their scores via Facebook. This allows staff to compare scores and comments with colleagues online and create a little healthy competition! 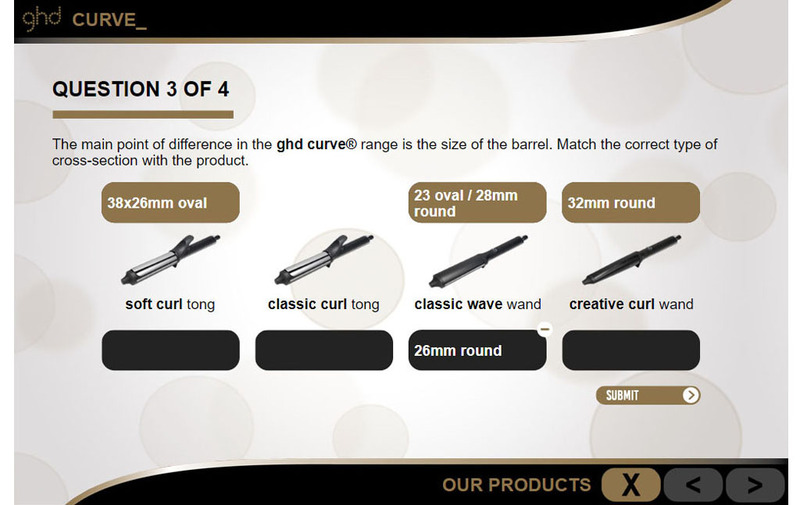 Because of the sheer volume of products that ghd make, from electrical equipment to hair care products, the LMS for ghd holds a lot of technical content. To ensure this would be easily accessible as a reference for sales staff, Day One developed a special search function within the LMS. We think this is pretty unique! The LMS for ghd also features the ability to customise access to the platform’s various features – this means that whether the system is being used by a trainee, a trainer, a manager, an admin or a developer, their access can be limited to the parts of the platform that are relevant to them e.g. a trainee needs access to the training scores for the whole company like a fish needs a bicycle. Whatever your learning platform or sales training needs, the Day One team can deliver on them with a bespoke solution. We can help you to develop your internal staff or your channel sales partners, distributors or customers as part of an extended enterprise training programme. Want to learn more? Contact us for an informal discussion about your needs. See how we delivered white label elearning software and courses as part of a wider programme of solutions.